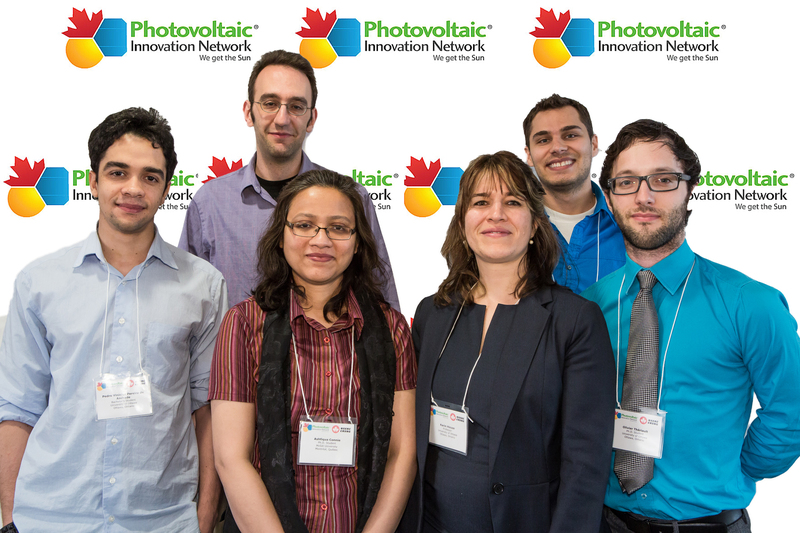 left to right: Pedro Andrade (Undergraduate student – University of Ottawa), Professor Jacob Krich (Project Co-Investigator – University of Ottawa), Connie Ashsfiqua (PhD student – University of Ottawa), Professor Karin Hinzer (Project Leader – University of Ottawa), Ross Cheriton (PhD student – University of Ottawa), and Olivier Theriault (PhD student – University of Ottawa). Please see below for an update on this project’s direction. ::Download Scientific Description:: ::Project Researchers and Highly Qualified Personnel:: ::Project Scientific Progress:: Very high-efficiency solar cells are typically made of a stack of solar cells in a so-called multi-junction architecture. Each solar cell in the stack can optimally absorb light in different regions of the solar spectrum and therefore, the stack can produce more power overall. These advanced cells are made of compounds called III-V semiconductors (ie. GaAs, InP, GaN, etc. ), or sometimes I-III-IV (eg. CIGS), indicating that the material is actually a compound made of elements from Group I, Group III and Group IV elements in the periodic table. 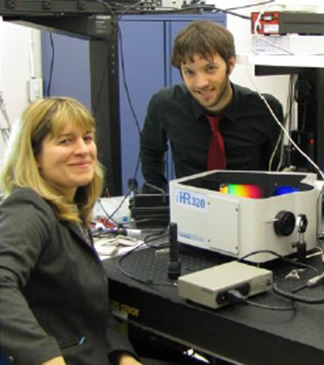 Figure: Project 11 Leader Dr. Karen Hinzer is shown working at an optical bench with HQP Olivier Theriault in The University of Ottawa’s SunLab. A unique problem to this arrangement is that all the solar cells in the stack must produce the same current (called current-matching). This means that each cell in the stack should absorb the same number of photons. However, designing for this can be tricky and it is often the case that each cell does not produce an equivalent current, resulting in diminished efficiencies. The optical absorption properties of a semiconductor are dependent largely on what is called the energy band gap and in a conventional multi-junction solar cell each cell absorbs light from a different region of the solar spectrum because each has a different energy band gap. The energy band gap is normally a static quantity for a given semiconductor alloy and thus light absorption properties normally are fixed as well. However, one way around this restriction is through so-called band gap engineering. If the bandgap can be engineered then that means the optical absorption properties can be adjusted as well and this can lead to multi-junction cells which are current-matched, and therefore more efficient. The bandgap engineering technique under investigation in this project is based on creating an intermediate energy bandgap in the normal energy bandgap of the semiconductor. This can extend the materials light absorption capabilities towards the red light end of the solar spectrum. It is achieved by using something called Quantum Dots (QDs). QDs have unique light absorption behaviour owing to their very small dimensions and can, in fact, be tuned to absorb different regions of the solar spectrum. When QDs are grown into a standard semiconductor material they give scientists and engineers the capability to fine tuning the light absorption properties of the materials system. Figure: Trasnmission electron microscope images of InGaN/GaN QDs. Specifically, this project will focus on InGaN/GaN QD intermediate band solar cells grown on silicon substrates through growth optimization and device fabrication combined with modeling and simulation. The goal is to demonstrate the intermediate band concept in a working device at low temperature and then probe the role of the QDs and the surrounding material in such a functioning device. In addition, the integration of CIGS material in a QD-enhanced multi-junction PV device will be further explored theoretically. Update 2015: The end goal is to explore novel materials systems for use in low-cost, high efficiency solar cells. Our current objectives have shifted to focus more on the development of nanowire solar cells, as the objectives for research on copper indium gallium selenide solar cells have been completed.